The story of his willingness to risk his life for others will come later. 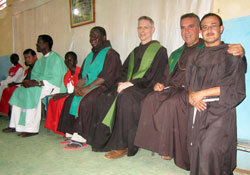 Right now, Franciscan Father Michael Perry is sharing a story about a remarkable day of faith in Africa. It happened shortly after the Indianapolis native arrived in Africa to become the pastor of a mission that was about half the size of Indiana. As the only ordained priest assigned to the mission, Father Michael led a group of six lay leaders to a remote community where he planned to celebrate Mass. It’s also a day that reveals everything at the heart of Father Michael’s life. He has the courage to venture into the unknown and risk everything—a quality he admired in his immigrant ancestors. He has a faith that leads him to want to share it with others and the world—a foundation that he says he learned while growing up in Holy Cross Parish in Indianapolis. The 56-year-old priest also has the belief that God has a call for each of us— sometimes leading us to places and moments we could have never imagined for ourselves. For many of his nearly 30 years as a Franciscan, Father Michael has served as a pastor, advocate and director of development projects for communities in Africa, including his work for such organizations as the U.S. Conference of Catholic Bishops and Catholic Relief Services. He is also one of the founding members of a coalition that sought to end the genocide in the Dafur region of Sudan in Africa. In 2009, Father Michael was elected vicar general—the second in command—of the Order of Friars Minor, the Franciscan order of nearly 14,500 friars in 113 countries. Living in Rome, he also is the procurator general of the order, serving as a liaison for the Franciscans with the Vatican. Those experiences are part of his amazing journey of faith that began in Indianapolis, where he returned in late July to be reunited with family members and friends during a long weekend. Here is an edited version of a conversation with Father Michael before that reunion. Q. You grew up in Holy Cross Parish. Talk about its impact on your faith. A. “I grew up there in the late 1950s, ‘60s and early ‘70s. Faith was at the center of our family. It was a family of prayer. I grew up in an Irish household, and heard the Irish stories of struggle, faith and hope—what kept people going. Q. What led to your vocation? A. “A couple of things. I was involved in the retreat program at my high school [Roncalli High School in Indianapolis]. That helped strengthen my values. The Sisters of Providence also always played a role in my life. One of the sisters was my music teacher, who had to put up with my antics. She invited me to an ecumenical prayer service between some Catholics and some Methodists to do a service project in Appalachia. The service coordinator was a Franciscan working in West Virginia. “At the time, I worked for a Catholic building contractor. Because of his sense of faith, he gave me a small salary so I could go to Appalachia and rebuild homes for senior people living on very limited resources. During that time, I started reading about [St.] Francis of Assisi. Q. Any defining moments from that part of your life? Q. You professed solemn vows in 1981, and were ordained a priest in 1984. How would you describe your life as a Franciscan? A. “It’s been an absolutely incredible adventure. Like all adventures, it’s had its high points and low points. The high points have included the absolute power of living in fraternity as men of the Gospel. There’s also the ability as a member of an international religious order to be able to reach out to the world and break down barriers. Q. Talk about some of your defining moments in your efforts to make a difference in Africa. A. “I was one of the founding members of the Save Dafur Coalition, which was formed to bring an end to genocide and an end to the conflict in western Sudan. The movement was formed in 2003, and the Catholic Church played a very important role in the coalition. “In 2004, we were one of the first outside groups to go to Dafur and see firsthand the suffering of the people. I went with Bishop John [H.] Ricard of Pensacola-Tallahassee and Ken Hackett, president of Catholic Relief Services. Truthfully, we had a 50-50 chance of coming out of there. There was a chance we would be taken hostage. There was a chance we could be killed. Q. What has it been like for you as vicar general of your order? A. “It’s given me a breadth, a depth of the Franciscan movement worldwide. It’s given me wonderful opportunities to interact with people in this circle. It’s also allowed me to look through the window of Franciscans on the ground and what they’re doing—some of the challenges they’re facing as they accompany the Church throughout the world. Q. What is the feeling for you when you get the opportunity to return to Indianapolis?